At the close of the day, TraderFeed will have finished a year of publication. I want to thank all readers who have made this a most rewarding experience. As a note of thanks, I'm going to suggest a trading pattern that is quite powerful and that just happened to make me a few pennies this morning. The pattern occurs when one or more of the big global markets--the dollar, gold, oil, or treasuries--breaks out to new highs or lows. The more significant the breakout--and the more markets participate in the breakout--the better. Today, we saw the Euro break out to yet further highs vs. the dollar and the 10-year Note break to new highs (i.e., yields broke to new lows). From the point of the breakout move (just as it's begun), trace the volume in the stock indices to see if: a) volume picks up; b) the distribution of volume (at bid vs. offer) becomes skewed; and c) the NYSE and Dow TICK become skewed. Specifically, you want to see if large traders enter the market around those points and whether they're dominantly entering on the buy or sell side. What you're tracking are the global macro participants in the marketplace. Many of these are hedge fund and investment bank traders, and they have the size to run the locals over. When you track the global markets *and* the trade flow, you start thinking like the macro traders yourself and you can ride their coattails. IMO, this may be the most valuable and practical blog post I've come up with this past year. Markets are global and markets are interrelated. If you focus only on *your* market, it's easy to get run over when the big money managers act on a theme you don't even see. If you start thinking like the pros, you may just start trading like one. U-Turns In The Market: What Comes Next? We've had an unusual situation in the stock market, in which we had a high momentum decline on Monday followed by a two-day recovery that erased that decline on strong positive momentum. The natural question to ask is: What has happened historically following such market U-turns? Before I address this question, however, allow me to step back and reflect upon how to utilize these historical findings. For me, they are background: they tell you if there has been any directional edge to the market under current conditions and how large that edge has been. If I see a decent skew to the data, that forms a hypothesis in my mind that will help shape my thinking about the market 1-5 days out. A hypothesis, however, is not a conclusion. A hypothesis is an idea that needs to be tested out. In trading, what tests the hypothesis is the actual supply and demand that occur in the market under real time conditions: how much volume is being done, at which prices, at the market bid or offer, and by whom. If my hypothesis shows a bullish bias for the next day of trading *and* I see large traders lifting offers early in the AM, I will wait for a pullback and enter in the direction of market sentiment--and the direction of my hypothesis. So a historical pattern is really a heads up, telling you: "Be on the lookout for this". After we had the large market drop on Monday, my research said: "Be on the lookout for a rise". Heeding that heads up when you saw buyers become aggressive paid off. But that is different from treating the hypothesis as a conclusion and using the pattern as a mechanical trading signal. OK, so we had our decline and then our recovery: what happens next? Since 2004 (N = 729), we've had 24 days in which the market recorded strong downside momentum (Supply > 1000) two days ago and strong upside momentum today (Demand > 1000), using the indicators from the Trading Psychology Weblog. Five days later in the S&P 500 Index (SPY), the market was up 11 times, down 13, for an average loss of -.17%. That is weaker than the average five-day gain of .16% (415 up, 314 down). It appears that, overall, U-turns tend to turn all over again within a five day period. Interestingly, however, when the U-turn has occurred during a two-day period of positive sentiment in the broad market (NYSE TICK) and in the large caps (Institutional Composite), all five of those occasions were up the next day and four of five were up an average of .98% three days later. While five days is a very small sample, the hypothesis I'm left with is that the willingness of traders to lift offers as we approach the bull market highs will be an important factor in whether or not we sustain an upside breakout. If we see sector divergences and waning lifting of offers as we test new highs, I'll be much more likely to look for yet another U-turn than if participation in the rise is broad, with sustained volume at the offer. TraderFeed finds an investment strategy based on disgust. Euro:USD, plus other technical analysis from Especulacion.org. Many thanks to Jesus Perez for translating TraderFeed posts to that excellent site. (Babel Fish translation). Massively cool: brain fitness for basketball players. I'll put the biofeedback topic on my list for upcoming posts. David Gaffen on frantic efforts to ignore the yield curve. The Big Picture offers bloggers' takes on retail sales. Wide ranging reading list from Victor Niederhoffer and Laurel Kenner. 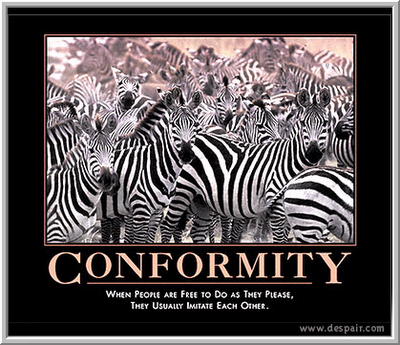 Great post on the persuasive personality and his corrosive effects from Trader Gordo. Lowell Christie shows how he trades what he sees. Lots of links from Charles Kirk, including a great quote on buying dreck from Altucher. Yaser Anwar analyzes Alcoa and aluminum. Boogster on using flexible moving averages. Interesting to see people's methods. Estocastica tracks a couple of day trades. Here are related trades from Trader X.
Humble Money, with some good questions about fair value. Great way to keep up with the news. Divergences? With Wednesday's rise, the S&P 500 retraced its Monday drop and is within 10 points of a closing bull market high. Just the same, only 29 S&P 500 stocks made 52 week highs on Wednesday and only 26 S&P 600 small cap issues made annual highs. That's about a third of the level of new highs seen during the past couple of weeks. My best estimate is that near term strength will bring multiple divergences, which will have me questioning the market's upside potential. Across the entire market thus far, 20-day highs peaked at 2052 on 10/26 and then again at 1951 on 11/15. Current 20-day highs are 1168. The market moved steadily higher Wednesday morning, dipped midday, and then finished strong. We closed above the day's average price of ES 1398.25, initiating a short-term uptrend. The Power Measure closed strong on the heels of late buying. Buying was once again evident in the broad market, with the Adjusted TICK at +465, and in the large caps, with the Institutional Composite ending at +246. Demand soared to 180--quite a turnaround from Monday's weakness--and supply fell to 22. New 20 day highs rose to 1168 (see above); new 20 day lows fell to 390. Institutional Momentum rose to a tepid -140, with 5 stocks trading in intermediate-term uptrends, 9 in downtrends, and 3 unchanged. It appears that we are attempting to test the recent highs, setting up a potential wide trading range. I will be careful about buying strength near those highs if the rally does not remain broadly based. Quite simply, if you asked my teen-aged children or their friends about any of the above, one of the first words you'd be likely to hear is "Ewwww!" "Ewwww!" is a very special term. It doesn't connote dislike. It expresses disgust. Complete and utter disgust. Someone vomited on the school floor? Ewwww! That kid who never used deodorant in junior high school? Ewwww! The creepy teacher who looks at girls the wrong way? Double Ewwww! The thing about "Ewwww!" is that, for all practical purposes, it is a final verdict. Once something is "Ewwww! ", it never turns around and becomes "Cool" or "Cute". In other words, once you've hit the "Ewwww!" point, you're toast. Just ask the Republican Party in the wake of Congressional Page scandals or Michael Richards after his very un-Kramereque racial diatribe. People can bounce back from dislike or even distrust. But not Ewwww! Having spent years in Upstate New York, my wife and I were spoiled by shopping at the wonderful Wegman's grocery chain. Now, we live outside Chicago and dislike our area groceries. But we shop there. One day, however, we visited a store that had dirty floors and unkempt displays. We left and never returned. And never will. That's the way it is with Ewwww! You're probably wondering what this has to do with investing. My hunch is that it might be quite relevant. You see, we are hard-wired to experience disgust. The facial expressions that express disgust in one culture are universally recognized in other cultures. And many of the things that disgust us also disgust people around the world: from feces to spoiled food. It makes evolutionary sense. Memories of disgusting experiences keep us away from what is bad for us. Some of the earliest studies of single-trial learning in animals (i.e., learning that does not require repeated practice) tested memory for disgusting food. It appears that dogs and mice have their own versions of Ewwww! What makes humans different is that they can attach disgust to social experiences, not just physical stimuli. That means that companies and their products can evoke the Ewwww! response. And that means that we have an interesting pairs trading strategy: short the Ewwww! stock and go long the correlated, acceptable company. If I had listened to my kids and their friends, for example, I'd be short Wal-Mart ("Ewwww!") and long Target (see above). No one, but no one, among their peer group would be caught dead in Wal-Mart. But Target? Those Choxie candies are cute...and how about those flip-flops on sale? Come to think of it, the Ewwww! factor would have long ago had me short the American autos ("Ewwww!") and long Toyota/Lexus. And I'd have been short Dell ("Fire in my laptop??? Ewwww!") and long H-P. The great thing about "Ewwww!" is that, because it's hard-wired, it doesn't turn around in a day, week, month, or even year. Sometimes it doesn't turn around ever. I guess you could say the "Ewwww!" factor is the opposite of Warren Buffet's investment strategy. He would have you buy the companies you directly experience, understand, and really like. Trading by "Ewwww!" has you shorting what people absolutely can't stand and buying its favored alternative. Just the other day, we stopped off at a local eatery known for its fresh fast food. Earlier, we had passed a McDonald's, and I offered to stop. Daughter's verdict: "Ewwww!" No longer cool to be part of the "fast food nation". 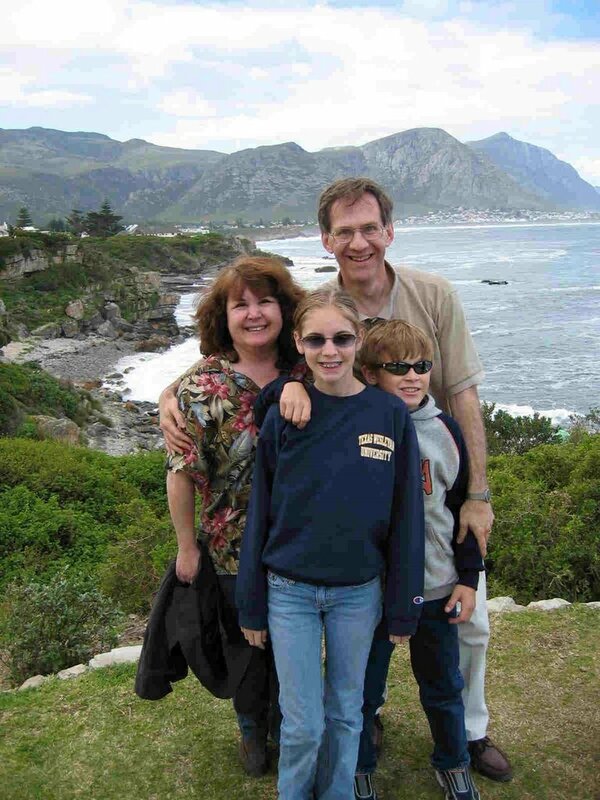 Another family trip, another investment idea percolating. We got the bounce that the recent research suggested, which made for a nice trading opportunity following the data release at 9:00 AM CT. If you click the above chart, you'll be able to see the steep volume on that rise into the 9:50 AM bar. We got a selling squall after that and then one more push toward highs. Note that this push came on lower volume, with far fewer contracts lifting offers. (Remember, within each bar, the first number is the volume transacted at the bid price; the second number is the volume transacted at the offer. When we get more volume at the offer, the bar turns green). Quite simply, the buyers ran out of steam and we have since retraced some of the gains, with the TICK hitting a very oversold -915. At this point, we're looking to form a trading range between today's highs and lows, and I'd be looking for evidence of selling drying up (prices holding near their lows where the TICK hit its negative extreme, and higher TICK lows on subsequent selling) prior to getting back in on the long side. Specifically, I'd be looking to buy pullbacks that stay above the 1384.25 lows on evidence of reduced selling pressure. What you're looking for is the ebb and flow of volume from the market and the distribution of this volume among buyers and sellers. Reading those shifts is essential to short-term trading. More on today's market on the Weblog tonight. Big Bear Days: What Comes Next? Monday's market was unusual in a couple of respects. First, there was tremendous short-term bearish sentiment, as measured by the NYSE TICK. Recall that the TICK is measuring the number of stocks in the NYSE Composite Index that are trading at their offer price minus the number trading at their bid. My Adjusted TICK measure simply transforms this data series to obtain a zero mean. Monday's Cumulative Adjusted TICK reading was -1418, the third lowest reading since July, 2003 (N = 839 trading days). What that means is that, across the broad universe of NYSE stocks, traders were hitting bids. Sellers were bailing out at the bidders' prices, taking whatever the market would give them. Monday's market was also unusual in that the ratio of stocks displaying significant downside momentum outnumbered those with significant upside momentum by a ratio of over 10:1. Indeed, since July, 2003, we've only had five other occasions in which this ratio was so lopsided. My measure of upside and downside momentum, which I call "Demand" and "Supply" and track every day in the Weblog, simply tracks the number of stocks closing 2 standard deviations above and below their short- and intermediate-term moving averages. So what we had on Monday was a big bear day: lots of traders hitting bids across a broad range of stocks, sending the vast majority of issues well below their moving averages. Since July, 2003, we've had 15 trading days in which we've had the ratio of stocks with downside momentum exceed those with upside momentum by over 5:1 *and* an Adjusted TICK daily reading below -1000. The next day, the market (SPY) was up 11 times, down 2, and unchanged 2 for an average gain of .30%. That is much stronger than the average single-day gain of .04% over the total sample. Four days after a big bear day, SPY was up by an average .50% (11 up, 4 down), again stronger than the average four-day gain of .16% for the entire sample. Ten days after the big bear day, SPY was up by an average 1.07% (12 up, 3 down), once again much stronger than the average ten-day gain of .40% over the entire sample. So what we've seen is a tendency to bounce following big bear days, probably as a function of bargain hunting. Note, however, that this analysis covers most of the recent bull market. What we're really finding out with the analysis is that, in bull markets, selling squalls tend to right themselves. If the bull is healthy, we should see some evidence of those bargain hunters. Conversely, it's when no bargain hunters emerge that big bear days turn into big bear weeks and months. I hope that some of the themes from the recent morning sessions have been helpful to you in trading today's market. Notice that we have seen consistent hitting of bids across the broad universe of stocks, as seen in the weak NYSE TICK readings. We have also seen consistent hitting of bids within the S&P futures contract (ES), as measured by the Market Delta program. Note how, during periods of extreme weakness such as this, bounces in the TICK/Market Delta provide selling opportunities. You want to think of those indicators themselves as being in a downtrend. Once you make that identification, the move is much easier to trade. My preliminary measurements show that we have a lot of stocks across the board that are trading below their lower volatility envelopes (my measure of Supply on the Weblog). If we close that way, there is a tendency to get a small bounce higher before further weakness sets in. Of the 18 similar negative momentum days since 2004, 8 have been higher and 10 have been lower five days later in SPY, for an average loss of -.01%. It's tempting to go bottom fishing when we see such weakness, but as long as large traders continue to hit bids rather than lift offers, this is (and has been so far today) a losing proposition. It's when declines lose downside momentum that they offer superior returns--not when there is broad participation to the downside. Hope that's helpful. I'll do another AM session early in Dec. and hopefully can illustrate these ideas further. Have a great day. 1) Idiot #1: The True Believer - You've probably encountered at least one of these dolts during your market sojourns. They are the ones who have figured out the answer to the market. Not an answer, mind you. *The* answer. It usually is some kind of numerological or astrological scheme, and it is always a hidden secret. Unfortunately, True Believers don't seem content with keeping their knowledge hidden. They're always after you to "unlock the mysteries" of the market by sharing in their discoveries. A surprising number of True Believers are also True Bears, which means that they're forever predicting the end of the financial universe as we know it. They predicted it in 1980, 1990, 2000, and they're still predicting it. And when the market rallies and proves them wrong? Well, that just means the bubble is getting even bigger and the implosion of the universe will be even more profound. My take on True Believers? This is not investing or trading; it's cultism. And true believers are at the point where they *have* to believe, or they'd come face to face with the awful realization of the utter waste of time and money their beliefs have brought, as the Dow has risen from 775 to over 12,000 within a 25-year period. 2) Idiot #2: The Gambler - This is the "I'm-giving-up-my-job-to-become-a-trader-because-I-don't-like-working-9-to-5" idiot. Observe that this bottom-dwelling resident of the phylogenetic scale is not giving up his job because he's had success at trading. He's also not giving up his career because he so loves trading that he researches it day or night and has found a winning edge. No, The Gambler doesn't do anything beyond 9-to-5, because what he's after are easy riches, not effort and earned success. He hears that others have been successful (usually from Idiot #3), and he figures, "That means I can do it too". Invariably, the Gambler is attracted to daytrading. Why? It gives him a sense of action, and it justifies his decision to abandon all efforts at productive work. Besides, you can't really explain to your wife and kids why you're not out there with working humanity supporting your household when you're sitting around doing nothing, holding positions for weeks at a time. So the Gambler actively trades in and out of markets, pretends like he’s got a job, and every so often berates his spouse when she wonders when the family will be able to pay its bills. My take on Gamblers? They're not interested in trading; they're interested in their fantasy. So interested that they'll take their bank accounts and families down with them. 3) Idiot #3: The Self Promoter - It's easy to find the Self-Promoters. By their very nature, they're in your face hawking their wares, lauding their recent market calls, and promising easy trading success. Open any trading magazine and you'll see their well-coiffed, grinning idiot faces leering at you, usually as part of a trading "event" that just happens to be selling all their products. The key to recognizing Self-Promoters is that they promote themselves, not ideas or methods. Indeed, a substantial number of them don't trade. Those include the "Trading Coaches" who promise to improve your confidence, but offer no concrete trading guidance that you could ever feel confident in. They also include the "Gurus" who tout simple chart patterns and indicators, carefully avoiding any possible objective testing of their wonderful setups. Self-Promoters never talk about how hard it is to achieve trading success; that would not sell well, especially among The Gamblers. Instead, they borrow their pitches from the "no money down" real estate guys and tell you how easy it will be to succeed with no capital. My take on Self Promoters? I don't mind people who deceive others; they're merely dishonest. It's the ones that deceive themselves that frighten me. That's when dishonesty becomes delusion. So there you have it: a rogue's gallery of trading idiots. Once you tune your mind to this threefold taxonomy, you'll have no problems at all recognizing them within moments of their opening their mouths. And, if you want to be happy, you'll follow the advice of literary critic Dorothy Parker and not toss these idiots aside lightly. Rather, you'll hurl them with great force. Some of the best trading opportunities are in the least popular investments. Take the world stock markets. Above we have a chart of the S&P 500 Index (SPY; blue); the Vanguard Pacific ETF (VPL; yellow); the Vanguard Europe ETF (VGX; red); and the Vanguard Emerging Markets ETF (VWO; light blue). Going back to March, 2005, we can see that the most popular of the indices has also been the most punk performer. In terms of directional movement and volatility, we've had better trading opportunities from almost any other major portion of the world. The best investment talent in the world--including many hedge fund and investment bank traders I've been privileged to know--shares one thing in common: they are not restricted to particular trading instruments or asset classes. They also do not limit their trades to vehicles within a particular set of national boundaries. They go where the opportunity is, whatever and wherever that might be. With ETFs, it is increasingly possible for individual traders to pursue a world full of opportunities. Value vs. growth? National vs. international? Equities vs. fixed income? Currencies, commodities, equity sectors? All can be traded from a single stock market account. Old habits die hard. We gravitate to the known trading instruments. But there's a trading world at your fingertips--and it's expanding every month. My Weblog entry for today found something surprising: the correlation between the surveyed bullishness of investors (Investors Intelligence survey) and their actual ratio of mutual fund purchases to redemptions has been slightly negative. In other words, what investors say about the market has had no positive relationship to what they're actually doing--at least with respect to mutual funds. Above, we can see the ratio of fund purchases to redemptions from 2000 to the present, charted against the Dow Jones Industrial Average (N = 334 weeks). Note how the ratio was consistently elevated above 1.0 during the 2000 market top and dropped below 1.0 during the subsequent decline. Notice also that we rose well above 1.0 in May of this year at the market top and dipped close to 1.0 at the market bottom in July prior to the recent rally. So far, we haven't seen a meaningful bounce in the ratio as the market has ridden its wall of worry higher. 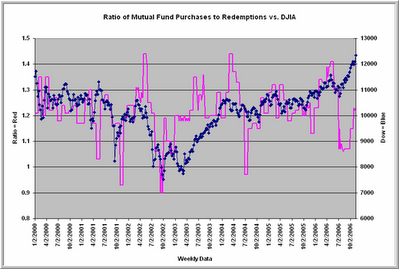 Since 2000, dips in the ratio of mutual fund purchases to redemptions have provided solid buying opportunities. When the ratio has exceeded 1.20 (N = 198), the next 20 weeks in the Dow have averaged a loss of 1.29% (92 up, 106 down). When the ratio has been below 1.20 (N = 136), the following 20 weeks in the Dow have averaged a gain of 3.36% (93 up, 42 down). It appears that investors attempt to time their mutual fund purchases and redemptions and have been quite poor in their timing. While we see very bullish sentiment in the recent surveys, the ratio of mutual fund purchases to redemptions has only recently popped up to 1.25. Should we see higher ratios ahead--approaching the 1.4 level from May and from early 2004--I'll take that as a yellow sentiment light for this market. As noted in the Weblog, throughout the recent bull market we have seen nothing like the 2-plus to 1 ratios from the 1990s; since the 2000-2003 decline, investors, as a whole, have been modest in their mutual fund purchase patterns. In other words, today's investors may talk a good bullish game, but they really haven't put their money where their surveys have been. Is the Dow in a Bull or Bear Market? Magicians are quite clever: they pull the audience's attention to their right hand and then do the "magic" with the hidden left. Markets aren't so different. While our attention is drawn to the numerator--the price change of an equity index such as the Dow--the real magic is occurring in the hidden denominator. That hidden denominator, in the case of the Dow, is the dollar. U.S. stocks and indices are measured in dollars. But the dollar itself is a moving target. And it's been moving down. Denominated in dollars, we have the magic of Dow 12,000. 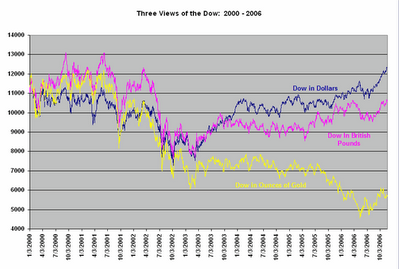 Denominated in British pounds, the Dow has only recovered a tad more than half of its 2000-2003 decline. Denominated in gold, the original hard currency, the Dow has been in freefall and only recently recovered from multi-year lows. So how much of the bull market has been Dow strength (vigor in the numerator), and how much has been dollar weakness (a plunge in the denominator)? At the very least, judging from the red line, at least half of the Dow's strength can be attributed to weakness relative to other currencies. 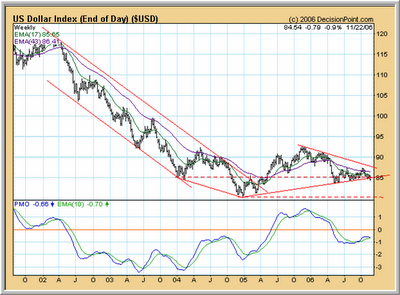 The Dollar Index chart I posted recently makes that point far better than I ever could. But bullishness in the Investor's Intelligence survey is at an annual high. Watching the right hand, we celebrate Dow 12,000. Meanwhile, no one mourns what's happening in the left hand. With the vigorous economic expansion we've had over the last few years--earnings for the S&P 500 stocks have tripled since 2002--one would think that the U.S. dollar would be robust vs. other currencies. As the chart from the excellent DecisionPoint service makes clear, however, the dollar is weaker now than during the start of the equity bull market. It's a little hard to see in the chart above--my Weblog entry has a larger chart--but we've broken trendline support in the Dollar Index. Now, this AM, we see the dollar in freefall against the Euro and Sterling and stocks are down in pre-opening trade by about a half-percent. Let's connect the dots. A large portion of the Democratic victory in Congress is attributable to the party's strength in the labor states of Ohio, Michigan, and Pennsylvania. Those candidates ran against globalization and won. The Democratic leadership has already worried Asian leaders, by going on record as favoring punitive tariffs against China if that country doesn't allow its currency to rise against the dollar. Which, of course, is another way of saying that Democrats want to reduce the value of the dollar vs. the yuan. The Secretary of the Treasury and the Fed chief have formed a delegation to China to head off a confrontation between the upcoming Congress and that country. Meanwhile, we now hear that China is considering reducing its dollar reserves due to--surprise! !--dollar weakness. That has tanked, not only the dollar in this morning's trade, but equities as well. The reality is that China has amassed foreign currency reserves to the tune of one trillion dollars. The message from China is that, if we push them too hard on their economic policies, they will push back by diversifying those reserves out of dollars and into Euros, Sterling, Yen, etc. That places Mssrs. Paulson and Bernanke between a Democratic rock and a Chinese hard place. It also generates considerable dollar uncertainty, which has gold rising this morning and stocks falling. Figuring out the investment themes that will be winners and losers in a weak dollar scenario may prove crucial for traders going forward. At the moment, with weak housing precluding meaningful interest rate hikes and the perils posed by the potential clash between Congress and China, it is difficult to imagine a scenario that does not involve, at the very least, a managed drift of the dollar lower. Particularly when you consider the expansion of M3 money supply in the face of an inverted yield curve, as noted by Barry Ritholtz. And at some point, global traders will question pouring their money into dollar-denominated assets that sport such currency uncertainty. Which is what we're seeing this morning. Will This Water ETF Keep Investor Profits Flowing? The New Yorker recently published an eye-opening article on the water shortage in the developing world and the possibility of global catastrophe. News reports of pollution in China's Yellow River and competition for water resources in India lend credence to the concern. Could water be the next oil, a commodity with huge price appreciation potential? The PowerShares Water Resources ETF (PHO) is one way to take advantage of this theme through a diversified group of stocks. The PowerShares site explains that PHO is based on the Palisades Water Index, which tracks companies that focus on the provision of potable water, water treatment, and technology devoted to water consumption. Over 52% of the portfolio consists of small-cap issues, while large cap accounts for about 11% and mid-cap about 37%. Industrials and utilities represent the largest sectors at nearly 60% and over 25% respectively. Over 36% of the portfolio is concentrated in the top ten holdings. So how does the ETF behave? 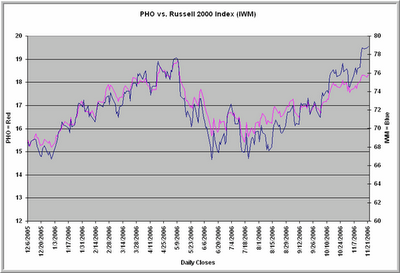 As the chart above indicates, PHO has been strongly correlated with the small cap stocks since its inception. It remains below its May peak, thus behaving more like a small cap growth stock than a value issue. The correlation between daily price changes in PHO and IWM is .81, meaning that over 64% of the variance in PHO price from day to day is accounted for by movement within the broad small-cap universe. The average price change from day to day in PHO is only slightly greater than for IWM: .96% vs. .87%. Interestingly, average volume for PHO has not grown over its relatively short lifetime. It peaked during its market peak in April, 2006 and is down to early 2006 levels at present. My earlier report on a promising sector ETF, the PowerShares WilderHill Clean Energy Fund (PBW), found that this fund has been growing its volume and is considerably more volatile than the Russell index. This points to a difference between the two funds: clean energy may be more on the radar of U.S. investors than water resources and hence generating greater speculative interest. Unfortunately, it is far easier to see Congress and the President aggressively moving on domestic alternative energy funding than water initiatives in developing countries. Nonetheless, there appears to be growing interest in ETFs with a conscience since the Democratic victory in Congress, so I'm keeping my eye on PHO. It has underperformed the recent market rally and its component stocks sport a generous 22 multiple to current earnings. Given the strong correlation with the small cap indices, my leaning is to wait for the next market pullback and assess the action in PHO from there. Although initial volume has been impressive for a relatively new ETF, I will want to see growing investor participation in the fund as a sign that the water-as-natural-resource theme is taking hold. Are Moving Averages A Useful Trading Guide? Is the market trend up, down, or neutral? One of the most common ways to assess a trend is the moving average. But is the moving average a useful guide for trading decisions? I decided to take a look. Since 2004 (N = 710 trading days), we've had 328 days in which the S&P 500 Index (SPY) has closed above both its five-day and twenty-day moving averages. Over the next ten days, SPY has averaged a loss of -.03% (182 up, 146 down). Conversely, when SPY has closed below both its five-day and twenty-day moving averages (N = 200), the next ten days have averaged a gain of .72% (126 up, 74 down). Indeed, just knowing where the S&P 500 Index has been trading relative to its 20-day moving average has been informative. When we've closed above that moving average (N = 441), the next 20 days in SPY have averaged a gain of only .20% (261 up, 180 down). That's about a third of the average 20-day gain from 2004 to the present. On the other hand, when we've closed below the 20 day MA (N = 269), the next 20 days in SPY have averaged an impressive gain of 1.24% (188 up, 81 down). In short, knowing where we're trading relative to moving averages *has* provided us with useful trading information, but not in the way many technicians expect. Because of mean reversion, returns when we're trading above moving averages have been subnormal. Returns when we've been trading below moving averages have been superior. The trend has indeed been your friend in the last few years in the large cap stock indices, but only if you've faded it. Note: The following was submitted to a local contest asking residents of the Naperville area to write their stories of a "journey" related to Thanksgiving. This captured my favorite journey, with our son (above), Macrae. He was diagnosed as having brain damage. That explained why he was kept in a separate hospital wing in the Moscow orphanage. The video taken by own oldest son, however, told a different story. The little 13-month old guy who weighed only 15 pounds—in the early nineties, food and medicine were in short supply in Russia—seemed alert and engaging. He interacted with his caregivers, and he played with the few toys in his area. His movement, his emotion—all appeared to be normal. And so it was that we made a three-week trip to Moscow and wound our way through the social service system to finalize our adoption of little Pavel, soon to be known as Macrae. It was not only a journey across an ocean, but across cultures. In Moscow, we were the foreigners in a strange land, but we and our hosts were also bound by a common desire: to secure a loving home for that eager boy in the video. Little did we know that the most meaningful part of the journey would occur during the ride home. And some ride it was: Thirteen hours with an excited toddler squirming on our laps. After seeing only his hospital unit for his short lifetime, Macrae was far too excited to be in the real world to ever fall asleep. I held him close, and he looked up at me. He pulled his head back just a bit. Bump! In a flash, he tapped his forehead against mine. I was a bit startled, but stroked his head and continued holding him. Bump! This time his head hit mine harder. Ouch! I shifted him back on my lap and the sequence began anew. He pulled his head back. CLUNK! This time it was a big knock against my head. What was going on? A dim voice within me entertained an awful thought: Maybe he really *is* brain damaged! It made for an interesting trip: holding Macrae close, pulling away to avoid getting head-butted, and him starting the action all over again. In the orphanage, the care givers played a game with the male children. The game was called “ram”. They would count to three and touch heads, just like rams. Only I wasn’t playing the game! I wasn’t counting, and I wasn’t touching heads. So, with ever greater insistence, little Macrae tried to get me to play. Quite literally, he was attempting to knock some sense into my head. It was the greatest journey of all: the journey of understanding. Our new son didn’t have a problem. He was trying to bond with us in the only way he knew. I was the “brain damaged” one, unable to pick up on his communications! How many other misunderstandings in life—between people and between cultures—could be resolved if we just took that journey to understand what is communicated, not just what is heard? 10:20 AM CT - I'm not trading any more today, but if I were, I'd think about the AM highs and lows forming a range and fading moves toward the edges of that range. I don't see enough selling pressure at present to sustain a downtrend, but I'm also not seeing good volume participation on rises. Hope this has been informative. We'll do it again early in December. In the interim, have a great Thanksgiving, and please give thanks to the family and friends who contribute daily to your happiness and success. Trading is important, but it isn't life. Thanksgiving calls on us to take the big picture and remember the blessings we have, regardless of P/L. I'll update the Weblog tonight and both sites through the long holiday period. 10:15 AM CT - Carbon copy of the first trade! I saw selling dry up after the initial retreat from highs and went long ES to take advantage of a return to the day's average price. The problem was that the move took a while to materialize, leading me to take a small profit before the market eventually went further my way. After each day of trading, I like to evaluate what I did right and wrong and use those to frame goals for the next session(s). What's clear to me from today is that I need to stick with my basic method of exiting positions: entering with enough size that I can take quick profits on one piece but let the other piece breathe and take advantage of a possibly longer move. I was too much in the mindset of "This is pre-holiday; just take what the market gives you". As a result, I didn't benefit as much from the patient, good entries as I should have. The point is to always be learning. Figure out what you do well and extend it. Adjust what you're not doing well. Today I did entries much better than exits. One last post before breaking for the day. 10:05 AM CT - OK, I'm done for this AM with the trading. I had gone back to breakeven and didn't execute the stop, seeing that the other indices (Russell, NAZ) were holding up, as was the TICK. The next bounce had little volume to it, so I took the little bit that I could. Volume has really slowed here, and we could get a pretty slow day from here on out as traders leave for the holiday. Back with a wrapup in a few minutes. 9:52 AM CT - Volume has been unimpressive on the buying. My stop is up to breakeven and we'll see if any buyers come in. As long as that TICK distribution looks shifted positive and we're not seeing big traders hitting bids in ES, I'm sticking with the long position. Once again, had I been trading larger size, I would have taken a profit on the first move up with one piece and let the other one ride. What I'd like to see is a buying spurt over 1000 TICK to take me out. 9:40 AM CT - When we got an ES low at 9:31 AM, nothing else was making a low and we weren't getting an expansion of selling from large traders in the ES. Indeed, only 308 more contracts traded at the bid than offer during that five min bar. The TICK also wasn't expanding in a negative direction. Volume, however, has been tailing off and we're not seeing buyers jump into the market. So I may scratch here if nothing develops soon. 9:32AM CT - Long small ES position. 9:25 AM CT - I'm looking to go long a small ES position if we pull back and can't get expanded selling when the bears take their turn. Still watching that TICK distribution closely. I'm also noticing that, so far, we're establishing value at a higher price than yesterday, which has me questioning the downside. 9:18 AM CT - Notice that we got the move back to the 1405 value area in ES. The general rule is that market rises that fail to lift many of the most volatile stock sectors are more likely to reverse than rises with broad participation. It's one reason that it's *so* important to watch the whole market, not just your particular trading instrument. That's probably the best learning lesson of this AM's session. Our next price target in Russell and ES would be yesterday's lows. I'd wait for buyers to take their turn, push the TICK higher, and see how prices respond. If we don't get good upside price movement, that could provide an opportunity to reinstate the shorts. Note the downward distribution of TICK since the early market high. Still, we haven't had very negative TICK readings, which says that buyers are covering and going away; it's not broad selling. I'd expect a range bound market out of that dynamic, not a broad trending decline. 9:12 AM CT - OK, I'm going to stop trading for now, just to focus on explaining what I did and why. The market moved higher on very strong NYSE TICK. Volume in the ES expanded on the move. So far so good for the bulls. The problem was that neither the midcaps nor the small caps made new highs on that move. Neither did the semiconductors. So my reasoning is that, if we're not getting economic/fundamental reasons for an upmove, if we're in a pre-holiday session, and if major sectors of the market aren't participating in the move, then I want to fade that move. And I chose the weakest index at the time: the Russell. As it happens, I could have held that position longer and taken more out of it, but the TICK distribution just didn't look negative enough to me, so I got out with what I had at the time. Generally, if it's not a preholiday and I can watch every tick carefully, I'll bail out of part of the position and hold the rest for a move back toward the day's average price. That's been a sound idea even in this preholiday trade. 9:02AM CT - Took a 1.5 pt profit, now just watching the mkt. Back in a couple min. 8:52 AM CT - Of course, what I'm looking for with the short Russell position is a failure to move to new highs, followed by selling that would make the longs puke their positions and move us back toward that value area. Risk reward ratio is good on the trade, though if the TICK stays persistently high, I'll need to bail out. Ideally I'd let a selling burst to negative TICK take me out of the trade. Note that the NQ is heavy here. 8:45 AM CT - FWIW, I'm short a small Russell position here. 8:42 AM CT - Notice how staying on top of the distribution of NYSE TICK kept you out of any premature short ideas. We're seeing steady buying, and I wouldn't short this market until we see a shift away from that. Notice also how volume expanded greatly on the rise to new highs. If this breakout is for real, we should stay above the overnight highs. Note, however, that we *didn't* make new highs yet in the Russell. 8:35 AM CT - Remember, volume correlates with volatility and ultimately determines how much we can take out of a trade for a given holding period. So I look at the volume every five minutes to see if we're doing more or less business than average. This being a pre-holiday session, I'm not expecting big volume. That means that the locals and black box traders could dominate price action. I also look at the distribution of the NYSE TICK in early trade to see if buying or selling sentiment dominates, and I look at the Market Delta distribution of volume at the bid vs offer in ES. So far, TICK is positive and advancing stocks lead decliners by about 500 issues. Volume is predictably modest. 8:20 AM CT - Just heard from Wiley that there will be a Japanese translation of my new book, Enhancing Trader Performance. On this Thanksgiving, one of the things I'm thankful for are the many traders/readers who have supported this blog and the book. I appreciate your comments and ideas and hope that these morning sessions help model one way of looking at markets. Your task is to take away from what I write what's helpful to you and leave the rest. Integrating other people's perspectives and methods into what you've already learned is how you ultimately develop your own trading style--much as artists or writers develop theirs. Back after the open. If I don't see good strength early in trade, I'll be short for a move back toward the 1405 value area. 8:10 AM CT - Just a quick note; we retreated a bit further from the overnight highs before bouncing a bit; clearly there was nothing bullish for stocks in the economic reports thus far. Note that the dollar made multi-week lows against the Euro on the weak housing data. When you get a chance, do read this important post from Barry Ritholtz. I think it goes a long way toward explaining why we've been seeing strong stocks of late, as well as firm commodities. The growth of money has meant that liquidity has had to find a home. The loser in such a scenario over time is the dollar. If I had to guess--and it's only a guess--I'd say that we're trying to pre-empt a housing-led recession by easing monetary conditions aggressively. Hence the inverted yield curve, but the sharp recent rise in large cap value stocks. As long as that persists, that should put a bid under commodities and a lid on the dollar. The risk is that we could stoke inflation (drop in the dollar; boom in commodities) at the same time that economic weakness kicks in, creating that old stagflation scenario that is bad for stocks. That's why watching the dollar, interest rates, and commodities is so important--even for the short-term trader. The big trends are created by those who trade global macro developments. 7:45 AM CT - Good morning. I'm writing this on the heels of the unemployment numbers coming out at 7:30 AM. We had mortgage applications drop during the latest reporting period despite lower interest rates; refinancing also dropped. That report, suggesting continued housing weakness, took the stock indices off their overnight highs. We still have University of Michigan consumer confidence numbers coming out at 9:00 AM CT. Note that subscribers to that number get the data ahead of the general public and thus get a jump on trading any significant change from expectations. Initial claims for unemployment came in pretty much in line with estimates; no great movement in stocks from that. Bottom line is that we're up relative to yesterday's close, though a bit off overnight highs. The average price we've been oscillating around has been 1404.50 in the S&P futures; my only trading yesterday faded moves above this value. Remember, in a range bound market, you want to fade moves to the range extremes if you see that volume (and especially the hitting of bids or lifting of offers by large traders) is drying up as we move away from value. So our big job this AM, should we continue to the upside relative to yesterday's close, is to figure out whether we're going to break out of this five-day trading range or settle back toward the recent average price. It's pre-holiday trading, so I don't expect a lot of volume or volatility. If you check the Weblog, you'll notice a directional bias to the next five days based on recent low volatility. Also check out this morning's TraderFeed entry that finds better movement in the Russell 2000 Index than in the S&P 500. I'm noticing that, while the S&P 500 hit contract highs this AM, the Russell has not so far. Let's see how much strength we get at the open and how broad it turns out to be. More before the open. With the VIX plunging below 10, I thought it might be worthwhile to take a broad look at stock index volatility. Here I'm focusing on the size of the daily percentage price change by taking the 20 day moving average of the absolute value of open-to-close change. In the chart above covering 2003 to the present, we can see how the average size of the day's movement in the S&P 500 (SPY; blue) has hit bull market lows. The NASDAQ 100 (QQQQ; red) and the Russell 2000 (IWM; yellow) have remained above their volatility low points. The trend that is apparent is that the average size of the daily price change in SPY has been reduced by about 2/3 since 2003. The average open-to-close change in QQQQ has been cut in half over that same period. 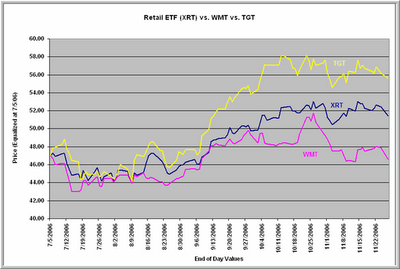 Notice, however, how IWM has retained far more of its daily price change volatility since 2003. 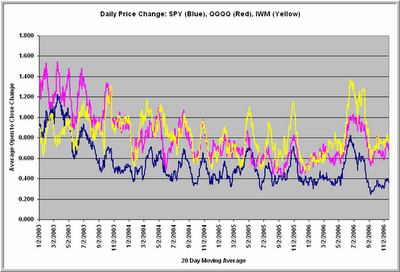 Note also that the current average percentage price change in IWM is twice as large as in SPY. In relative terms, far more volatility has come out of the S&P 500 Index as out of the Russell 2000. The volatility patterns of the three indices are highly correlated, as are their daily price changes. What this suggests is that, for short-term traders, the S&P 500 has been offering far less opportunity as a trading vehicle than either the NASDAQ 100 or the Russell 2000. For a given pattern that is valid across those markets, there has been more profit potential among the smaller caps and growth stocks than among the large caps. Moral of the story? It's not just how you trade, but also *what* you trade that determines your P/L. I want to thank Charles Kirk for including my books The Psychology of Trading and Enhancing Trader Performance among his top 100 list recently. Charles was gracious enough to host me on his site for a Q&A session, which was just posted. He was *very* prepared for the interview and asked some great questions. In fact, I'd say it was the best interview (and interview questions) I've ever encountered. If you read the financial blogs with any regularity, you're probably aware of The Kirk Report's extensive set of links and informative stock screens. Do check out the rest of Charles' site, especially within the member's area. That's where you learn how he trades, what he's thinking, etc. He's one of the good guys when it comes to educating and training traders. The donation required to become a member will provide you with one of your best returns on investment in any market. The other heads up is for the Morning With the Doc session I'll be conducting tomorrow AM, starting before the open. It should be a slow day prior to the Thanksgiving holiday, but that will give me time to illustrate a few methods for tracking the market and coming up with trade ideas that have an edge. My hope is that the morning sessions will help interested traders apply ideas from the blog to actual market conditions. We'll also apply the ideas to a busier market in early December. See you tomorrow! The difference between the market's opening price and its previous day's close forms a gap on a bar chart. Does this gap tend to fill in during the next day's price action? That is, when we open with a gap lower or higher, do prices subsequently move back to the prior day's close? For this investigation, I measured gaps as a function of the previous day's high-low range. This measures the gap relative to the prior day's volatility. Thus, an opening gap of two points that follows a day with a range of six points is measured as a 33% gap. The same opening gap of two points that follows a day with a range of ten points is measured as a 20% gap. Assessed in this manner, we find that the average opening gap is 27% of the previous day's range going back to May, 2003 (N = 897 trading days) in the S&P 500 Index (SPY). That provides us with a benchmark for defining relatively large and relatively small gaps. When upside gaps exceed 40% of the prior day's range (N = 99), 46 of them fail to close during the day session. When downside gaps exceed 40% of the previous day's range (N = 81), 40 of them go unfilled. Bottom line: approximately half of all large opening gaps don't fill during that coming day's action. Conversely, when the upside or downside gaps are less than 40% of the last day's range (N = 717), only 144 of them go unfilled. When the gaps are less than 20% of the last day's range (N = 431), only 51 of these fill in. Stated otherwise, 80-90% of relatively small gaps will fill in during the coming day's action. Interestingly, when we have a large opening gap to the upside, the *following* day's price change averages .18% (68 up, 31 down). When we have a large opening gap to the downside, the next day's price change averages .09% (48 up, 33 down). But when the opening gap is small, the subsequent day's price change averages only .03% (381 up, 336 down). In sum, large gaps in either direction tend to be bullish for the next day's price change. When we measure gaps in this fashion, it takes relative changes in volatility out of the equation. The average size of the opening gap, defined as a function of the prior day's range, has been the same in 2006 as previously, despite our dramatic drop in volatility since 2003. Standardizing how we measure gaps provides us with a better sense for when gaps are large--and are less likely to fill--and when they're small--and more likely to fill. My recent post looked at how to use ETFs for diversification. Here's an example of using a fund to pursue a sector theme. 1) On the heels of the Iraq experience, the U.S. will look to energy independence as a response to national security that will supplant the recent paradigm of unilateral interventionism. 2) Clean energy is a natural response to concerns over global warming that will help us re-establish ties with ecologically concerned allies abroad. 3) Clean energy is no longer a pipe dream, as the average consumer is now familiar with ethanol and hybrid engines--not to mention higher fuel prices. 4) Energy independence is increasingly seen as a way of taking us out of thorny competitions for resources with Russia, China, India, and developing nations. 5) Most important of all, clean energy has become as American as apple pie. Republicans are looking to launch a large initiative and Democrats are ready to make global warming a national priority. Bottom line? We're going to see an increasing share of resources devoted to clean energy, which could bring some green to investors in that sector. The problem, however, is that the sector is highly fragmented. Where do you place your bets: Renewable energy, such as solar? Power conservation? Clean fuels? Power storage? Fuel cell technology? The best play I can find in the field is the diversified one: the PowerShares WilderHill Clean Energy Fund (symbol PBW). The fund holds 42 stocks across the green spectrum and allots no more than 4% of the portfolio to any single stock. (Click here for details on the construction of the index on which the Fund is based). Most of the issues are small cap, pure plays in clean energy. Participation in the Fund has been growing. When it was first introduced in March, 2005, the average volume was under 100,000 shares per day. By June, 2006, the 50-day moving average of volume peaked at over 700,000 shares per day and, at present, is over 300,000. As investors seek a way to participate in the green theme without having to crystal ball individual stock winners, the volume should continue to expand. As the chart above indicates, PBW nearly doubled in value between May, 2005 and May, 2006. Volume exploded by over a factor of 10 during that time. Since then PBW has pulled back from May highs on reduced volume and failed to participate meaningfully in the recent large-cap/value stock led rally. Note also that the Fund is quite volatile relative to the S&P 500 Index. In 2006 thus far, the average daily change has been 1.42% and the average daily high-low range has been 2.25%. 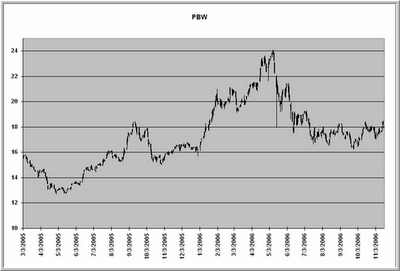 The correlation between PBW and the S&P 500 Index (SPY) during 2006 has been .62. That means that general market movement accounts for over 36% of the variance in PBW price. The correlation between PBW and the Russell 2000 Index (IWM) in 2006 has been .71, accounting for nearly half the variance in PBW price change. What to do? I'm waiting for a general market pullback and will assess PBW at that time. It may be a while before these stocks generate meaningful profits, and it will take Congress and the President a while to hammer out any clean energy initiatives. It is difficult to imagine, however, that the two parties, struggling for a popular response to problems with terrorism and global warming, won't try to outdo each other by wrapping themselves in the mantle of clean. And that could mean green for investors with a longer-term horizon. One of the questions I most frequently hear is a version of, "I'm doing well with trading. How can I grow my size?" To me, that's like saying, "I'm doing well with two dozen eggs in my basket; how can I load it with three?" Yes, it can make sense to take full advantage of an edge by trading at the largest size that allows you to survive any possible risk of ruin created when markets change and you get an inevitable series of losing trades. But it can also make sense to smooth out your equity curve by using your trading prowess to diversify into other trading vehicles. The key is to find instruments to trade that are not correlated with your original market. Fortunately, the world of ETFs offers a number of trading instruments with modest correlations to the major stock indices. The recent book Exchange Traded Funds for Dummies is, as its name suggests, a primer on the topic, but it is quite thorough and informative, pointing out ETF options I didn't know existed. The author understands the need for non-correlated instruments and also the need to focus on ETFs with low expense fees. All that is laid out in the text. So let's take an example. The Deutsche Bank Commodity Index Tracking Fund (DBC) came out in February, 2006 and tracks six groups of commodities: crude oil, home heating oil, aluminum, corn, wheat, and gold. The day-to-day correlation in price movement between DBC and the S&P 500 Index since inception (N = 191 trading days) has been .086--essentially zero. When you trade DBC, you are trading something relatively independent of stocks. How can we use this to broaden our trading horizons? Trading instruments such as DBC have their historical market patterns, just like the stock indices. SPY, for example, displays mean reversion tendencies following five-day moves: returns are subnormal following five-day rises and superior after five-day declines. In DBC, the reverse seems to be the case. When DBC is up over a five-day period (N = 102), the next five days in DBC average a gain of .38% (53 up, 49 down). That is stronger than the average five-day change of .24% (102 up, 89 down). Conversely, when DBC is down over a five-day period (N = 89), the next five days average a subnormal gain of .07% (49 up, 40 down). My research further suggests that volume and money flow, when added to the analysis, improves the batting average of this pattern. Imagine a basket of ETFs, each traded by a tested pattern and each producing returns independent of the others. When one pattern/instrument shifts and goes into slump, others are performing normally. The result is that you can avoid high leverage, produce consistent returns, and minimize drawdowns. 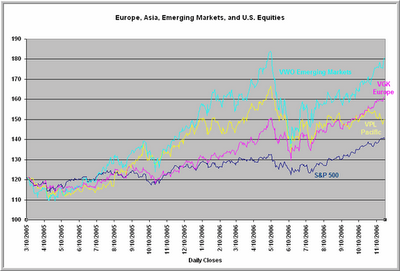 For the stock trader, ETFs have opened the world to currencies, commodities, fixed income, and international equities. This is surely one of the great trading opportunities out there. * I've bookmarked my recent, favorite entries on the Trader Performance page, including the most recent post that finds common ground across different trading theories. * This is the first biofeedback application that I'm aware of that is uniquely marketed to traders. I've used biofeedback to monitor my body's level of arousal during trading and have found it to be quite useful. 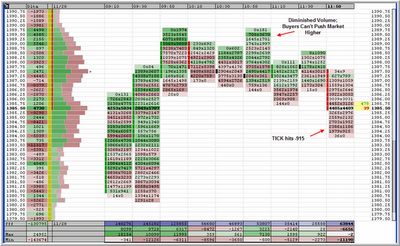 * Downloadable Market Profile resources from WINdoTRADEr. * At the Futures Trading Summit, I had a chance to preview the new version of TraderDNA and the many performance metrics it offers. I don't know of anything more complete; it spits out reports on your trading, allowing you to frame goals for self-improvement. * Ninja Trader offers a free version of their order execution software for simulation purposes and conducts training sessions for users. This is a great way to learn markets and test out strategies before risking your capital. I especially like how performance reports are built into the simulation. * I get questions about Market Delta as a performance tool because I utilize it in both my own trading and in working with traders. Here are video resources that show traders how to use the program to read volume patterns in the market. Trevor, BTW, can get you free admission to the excellent FIA Expo later this month. There are some good tools for traders out there, if you look hard enough! Enveloped in a sentiment, a sound that rushes over me. I have a faith as pure. Not forgetting what it means to dream. Entertaining thoughts that I've the strength of those I yearn to be. Cheers and tribute greet the saviours. The next Morning With the Doc session will be held this coming Wednesday, starting before the open with market prep and original research to help us trade that day. One of the comments that came from attendees at the Futures Trading Summit was a desire for more live trading educational sessions. That makes a great deal of sense. Teaching a person what to look for in a market is quite different from illustrating its recognition in real time. Many chart patterns, for instance, are far more recognizable in retrospect than during their formation. Live training is key to every performance field, from athletics to the elite military. Why should trading be any different? During the Morning With the Doc sessions, I track the market on this blog in real time and tell you what I'm seeing and thinking. I also point out any trades that I make. Here's the transcript of the last session and the one before that. My hope is that my mistakes as well as my good observations will be real time learning experiences and a model of one way to look at markets. The idea is not to mimic me, but to take away pieces of what I do that can supplement your own talents and skills. 2) Picking up as quickly as possible whether or not we're in a trending or bracketing market for the day. I'll also talk a bit about finding your niche as a trader and maximizing opportunity from market patterns. If there are other themes you'd like me to touch upon, feel free to mention these as comments to this post. My goal is to make these sessions as useful as possible. Thanks for your interest and support. It's not enough to get market direction right, if your timing is all wrong. Many markets (like the current stock indices) can form an uptrend by having occasional strong up days punctuated with periods of consolidation. If you buy after the strong days, you can get chopped up in the consolidation. If you sell the consolidation, you get run over by the bullish days. Markets can exhibit non-trending, reversing qualities on a short time frame and yet form a trend (i.e., conform to a trend line) over a longer period. Here's an eye-opening finding. Since 2004 (N = 718 trading days), we've had 385 days in which we have been profitable from open to close. Following such a positive day, the next two days in the S&P 500 Index (SPY) have averaged a loss of -.06% (185 up, 200 down). That is weaker than the average two-day gain of .03% (387 up, 331 down) for the entire sample. Conversely, when we've been down from open to close (N = 333), the next two days in SPY have averaged a gain of .21% (196 up, 137 down)--considerably stronger than average. In other words, if you just look for selling after an up day session and buying after a down day session, you would have had an edge--despite the fact that the market has been in an overall uptrend since 2004. The trend is not necessarily your friend if you're buying highs in a rising market. For the day timeframe trader, there's been no trending effect from day to day. Indeed, there has been a tendency toward reversal. This has also occurred at intraday time frames. The average open to close change in the S&P 500 Index since 2004 has been essentially zero. For daytraders and short swing traders, we've basically had no bull market in the last 2+ years. Whether we're in a bull or bear market in the big picture matters not at all if that trend doesn't filter down to the time frame you're trading. Failing to understand that has cost daytraders a lot of money. * Andy Bushak. professional trader: When you have an oscillator make a strong high, pull back, and then make another, weaker high, that divergence represents waves 3 and 5 in a five-wave Elliott pattern. Look for correction. * Jim Dalton, author of Mind Over Markets and the forthcoming Markets in Profile: Volume is crucial: How you get from point A to point B is all-important. The important question for the trader is whether price is attracting activity. If not, you'll have reversal back to value; if so, you'll have a trend. * Sheldon Natenberg, options expert and author: When volatility is low, buy protective puts for insurance. When volatility is high, sell covered calls. A good options trader is willing to take a lot of small losses in order to hit an occasional home run. * John Carter, trader and principal of Trade The Markets: Market internals (TICK, TRIN, Put/Call Ratio) will tell you as early as possible during the day whether it is likely to be an uptrending day, downtrending day, or choppy day. Ignore short trade setups in a strong market and vice versa. Watch for extremes in sentiment measures such as TICK and put/call ratio: the market will turn around and trap people at those extremes. Some of the presenters have written excellent books. Jim Dalton, Sheldon Natenberg, and John Carter come to mind immediately. Yra Harris was featured in the book House of Money by Drobny, which is an interesting profile of hedge fund traders. For traders interested in tracking their performance, a new version of Trader DNA is being rolled out and looks very user friendly. I'll be testing it out and reporting on it here. It's so nice to have finally found a good online connection here at the convention facility. If you've emailed me or sent blog comments, I'll get to the backlog ASAP. (I had 812 emails in my inbox when I opened it a few minutes ago!) I'll also be updating the Weblog by late Friday. Michelle B. via Trader Mike discusses finding your trading niche. See also Mike's post on moving averages--a nice concept you can apply to tracking your trading results. Lots of good links from Charles Kirk, including fear and greed and a worthy simulation platform. What to make of the low VIX? Views from Adam Warner. Has there *really* been Fed tightening? Great blog spotlight from The Big Picture. Inflation, money supply, and more among the links at Abnormal Returns. Zoom-mobile stock picks from Jon Markman. Do-it-yourself hedge funds from CXO Advisory. Maximizing your returns, a quant view from Dr. Chan. Here's a psych perspective on returns from Random Roger. Doesn't This Market Have to Go Down? Several attendees at the Las Vegas conference have asked me if we're ripe for a decline, given the "overbought" situation. My response has been that all market rises are not created equal. When a large proportion of stocks participate in a rise, the odds of continuation are much better than if the rise is dominated by just a few issues or sectors. Let's take a current example. I track the number of stocks making fresh 65-day highs and lows and compare this number to the 100-day moving average of new highs and lows. When fresh 65-day highs greatly exceed the average number of new highs that we've seen over 100 days, that tells us that participation in a rise is solid. Since 2004 (N = 703 trading days), when the relative new highs have exceeded 400--as at present--there has been no significant trading edge five days out. Twenty days later, however, the S&P 500 Index (SPY) has been up by an average of .94% (68 up, 23 down)--considerably stronger than the average 20-day gain of .58% (443 up, 260 down) for the entire sample. Stated otherwise, 70% of the time after a strong participation rise, we've had higher prices 20 days later, with superior average returns. Yes, geopolitical events, large interest rate movements overseas, and other situational factors could change the equation quickly. So far, however, during this upmove, when we've had rises with strong participation, pullbacks have been relatively minor consolidations. Selling strong upmoves for an intermediate-term hold has not been a winning strategy for the better part of three years. * From Yra Harris, currency trader and analyst: We didn't see an antiwar election; we saw an anti-globalization election. This dynamic greatly affected races in Ohio, Michigan, and Pennsylvania--areas in which the electorate perceives a loss of jobs due to globalization. This could easily lead to a greater push for protectionism, which would be fatal to global markets. * Also from Yra: Europe is suffering from the Yen carry trade, which exploits low Japanese rates and high European rates by borrowing Yen and buying the Euro. Watch for a shift in reserves, whereby Europe decides to add Yen in greater proportion to its mix. That would boost the Yen and wipe out the carry trade, carrying many markets with it. * Dominic Chirichella, energy trader/analyst: China now accounts for 12% of energy consumption, second only to the U.S. If per capita energy consumption in China reached U.S. levels, China would require all the world's oil production for its needs. This will keep a bid under energy for as long as China is expanding. * Braden Janowski, automated systems developer and trader: The goal of most automated trading systems is to place a "tax" on all your trades. When you enter positions at the market, you get a price that is out of line vis a vis correlated markets, providing a spreading opportunity for the black boxes. Over many trades, this tax adds up. * Philip Klapwijk, metals analyst: Silver has followed gold, supported by the great success of the silver ETF. But the fundamentals for silver are worse than for gold, due to lower industrial demand. Fundamentally, silver is a $6-7 metal. Of course, there have been many trading ideas/patterns provided as well, and more will come today. Good people, good show. I'll post some highlights from today late in the day tomorrow. When does it make sense to hold a position overnight? There may be a simple guide. Since 2004 (N = 722 trading days), when we close in the top half of the day's range (N = 411), the average subsequent overnight change in the S&P 500 Index (close to open; SPY) is -.02% (181 up, 230 down). When we close in the bottom half of the day's range (N = 311), the overnight change has averaged a gain of .11% (205 up, 106 down). What this suggests is that the overnight action tends to reverse the late movement during the previous day. Essentially all of the day-to-day upward drift in the S&P 500 Index since 2004 has consisted of this overnight reversal effect. Here's another interesting, related pattern: When we close in the top half of the day's range, the next day takes out the previous day's high 280 times and fails to breach the high only 131 times. We take out the previous day's low only 142 times, and fail to take out the low 269 times. When we close in the bottom half of the day's range, the next day takes out the previous day's high only 105 times and fails to break the high 206 times. But we break the prior day's low 185 times and fail to make a low 126 times. Bottom line? Where we close in the previous day's range seems to affect the next day's overnight and intraday trajectory. Combining this tendency with intraday setups can lead to very fruitful trade ideas. Some of my favorite trading patterns look at the relationship between price change and sentiment to find a short-term trading edge. My preferred sentiment measure for intraday trading is the NYSE TICK. I use an adjusted version of the TICK, which simply subtracts the 100-day average reading from the raw figure, creating a zero mean. Since 2004 in the S&P 500 Index (SPY), there has been a bullish drift. SPY has averaged a gain of .06% on a two-day basis, with 381 periods up and 337 down. Now let's divide those occasions into periods when the day's average TICK reading was positive (bullish sentiment) vs. negative (bearish sentiment). When the two-day Adjusted TICK was positive, the next two days in SPY average a loss of -.02% (187 up, 186 down). There's no bullish drift at all. When the two-day Adjusted TICK has been negative, the next two days in SPY average a gain of .16% (194 up, 151 down). What that tells us is that the bullish drift in SPY has been a reversal effect, in which markets move opposite to short-term trader sentiment. Returns are subnormal following bullishness and outperform following bearishness. Combine that principle with your favorite intraday setups and you can derive a nice little edge, as those who sold cover their shorts and those who bought puke out their longs. Understanding the dynamics of mean reversion is key to trading the current equity index market. Is Money The Rationale Or The Motivation For Trading? Here's an interesting thought experiment: Suppose you find a trading system that made money consistently in all market conditions. It was backtested objectively during independent time periods and handily beat your own trading performance. It also took less risk to obtain these results, with minimal drawdowns. The system's price is quite reasonable. The catch? The system trades four times a year. Would you obtain the system? Would you trade it? Would you buy it and then try to tweak it in various ways? Would you be able to follow its rules faithfully, or would you convince yourself in the middle of trades to take sure gains or limit losses? Such a system would not meet the needs of many traders: needs for action, needs to figure out the market on your own, needs to feel like *you* were beating the market. Money is the rationale for trading, but it is not the only motivation. Traders also trade to make themselves feel good, to validate themselves, to avoid a 9-5 job, and so much more. This is truly the source of most problems with "trading discipline": what we need to do to make money conflicts with the other needs that we impose upon trading. If we bring a host of unmet emotional needs to the perfect trading method, we will inevitably sabotage that method. A rich and fulfilling life outside of trading might just be the best trading strategy of all. Buying When The Yield Curve Is Inverted: Good Bet or Regret? 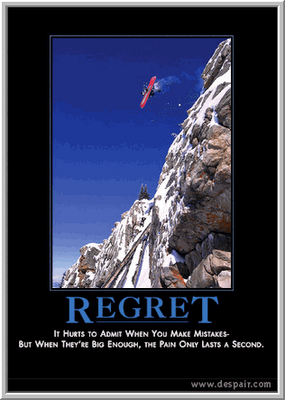 Those masters of the anti-motivational posters at Despair.com have it right: the worst mistakes are often the swiftest. So, it's with that in mind that I decided to take a look at the inverted yield curve in hopes of avoiding future regrets. After all, we always hear that inverted yield curves are bad for stocks, but here we are now--the curve having been inverted for a while--and we still stand at the summit above Dow 12,000. I went back to January, 1970 (N = 1872 weekly periods) and identified all occasions in which the yield on the 3 month t-bill exceeded the rate on the long bond. This is the case at present. It turns out that we've only had 277 such inverted periods over the past 36 years. When we look at the Dow Jones Industrial Average 40 weeks later, we see that the average price change following an inverted yield curve is a loss of -1.06% (105 up, 172 down). This is very much weaker than the average 40-week gain of 5.12% (1273 up, 599 down) for the entire sample. In short, buying the market during an inverted yield curve has indeed been a losing strategy. Consider some of the historical periods with inverted curves: January-May, 1970; March 1973 - December 1974; September 1978 - April 1980; October 1980 - October 1981; February 1982 - April 1982; August, 1989; July - December 2000. All in all, pretty bad times to have been in stocks if your holding times were within a two-year horizon. Note also that inverted periods can persist for quite a while before resolving in a decline and eventual Fed easing. This time, of course, *could* be different. No doubt that's what our friend in the poster thought as he passed the summit. Here's an intraday trading pattern that has performed quite well over the last three weeks, with a nod to the Trade Ideas Odds Maker. There are many new Web 2.0 tools to help you research your trading ideas. I'll be attending the Futures Trading Summit in Las Vegas this week and giving a presentation on Wednesday. Some of my upcoming blog posts will summarize what I've learned from this multi-day event. Both days of the Summit will be streamed over the Web for online registrants. The next Morning With the Doc will be Wednesday, November 22nd. We'll follow the market in real time and see if we can track patterns with a historical edge. Carl Futia lays out his scenario for this market, drawing upon the work of George Lindsay. Here are Charles Kirk's premarket trading ideas. Here's what Trader Mike is looking at in early trade. Here's trading ideas from Alpha Trends. The Russell 2000 has proven to be an increasingly popular trading vehicle. Indeed, average 50-day volume in the IWM ETF has risen by a factor of over 13 since July, 2003. The greater volatility of the small caps--and their outperformance through much of the recent bull market--have made the Russell an important trading market. Looking over the data from 2004 - present (N = 719 trading days), we see that the Russell does not tend to reverse the move of the previous day. The average daily change in IWM has been .05% (378 up, 341 down). After an up day in IWM (N = 378), the next day's average change is .056% (195 up, 183 down)--no different from average. Momentum effects do seem to occur in the Russell. When IWM is up and the number of stocks closing above their 20-day moving averages increases (N = 260), the next day in IWM averages a gain of .10% (142 up, 118 down). When IWM is up, but the number of stocks closing above their 20-day moving averages declines (N = 118), the next day in IWM averages a loss of -.04% (53 up, 65 down). Broad participation in market rallies thus tends to carry forward into strength the next day for the Russell; weak participation does not. The Russell does show signs of reversal effects as well. When the prior five days in the Russell have been up (N = 214), the next day in IWM has averaged a loss of -.03% (98 up, 116 down). When the previous week in the Russell has been down (N = 164), the next day in IWM has averaged a gain of .17% (97 up, 67 down). Buying after a week of weakness has paid off well in the Russell; buying after a week of strength has not. Finally, when we've had more than 1000 issues making fresh 20-day highs (N = 192), the next day in IWM has averaged a loss of -.01% (93 up, 99 down). When we've had fewer than 1000 issues making new 20-day highs (N = 186), the next day in IWM has averaged a gain of .12% (102 up, 84 down). Once again, we see that buying multi-day strength has not worked in the Russell. It is when we combine these factors that we can sometimes discover meaningful edges. When we see strong upside participation following multiday weakness, holding for next day strength exploits a nice edge. A rise with poor participation at a multiday high offers a cautionary signal. Knowing how your stock or index has been trading--its patterns of next-day returns--tells you a great deal about whether you should trade or fade moves to the upside. This Market Is Full Of Bull! How Can I Join A Trading Firm? Sell Stocks After A Week of Weakness? What Happens After A Bearish Engulfing Pattern?